It’s not the rate of return you realize from investments that really matters—it’s how much you pocket after taxes. For instance, suppose you have $10,000 to invest and you’re in the 35% federal income tax bracket. If a taxable investment generates a 10% return, your $1,000 in earnings will be reduced to $650 after you pay Uncle Sam. Conversely, if you earn an 8% return on a tax-free $10,000 investment, you walk away with $800—or $150 more. And that doesn’t even count state income taxes. That’s not to say you should sink all of your money into investments providing tax-free income, but it does make sense to be “tax-efficient.” That’s especially important in the wake of several new tax-law changes affecting upper-income investors. Start by analyzing the current tax landscape. (We’ll limit the discussion here to federal income taxes.) The top tax rate on ordinary income is 39.6%, while the usual 15% tax rate on long-term capital gains and qualified dividends is 20% for investors in the top tax bracket. Also, a 3.8% Medicare surtax may apply to a portion of your “net investment income.” At the other end of the tax scale, the two lowest brackets are 10% and 15%, and investors in these tax brackets owe zero tax on long-term capital gains and qualified dividends. 1. Asset allocation. The main question seems simple enough: Where should you put your assets for optimal tax performance? The answer isn’t quite as easy, and it can vary depending on your situation, but consider some basic guidelines. Try to use the lower tax brackets to absorb as much of your ordinary income or capital gains as you can. For example, if you expect your income to dip this year and you land in the 15% bracket, you might want to realize long-term capital gains qualifying for the 0% tax rate. Meanwhile, you may generally want to consider holding bonds that generate ordinary income in tax-protected retirement accounts, while keeping stocks that might produce gains or losses in taxable brokerage accounts. Your capital losses can offset capital gains plus up to $3,000 of ordinary income. 2. Drawdown strategies. Not only does asset location matter; your tax results also depend on what investments you tap first. Normally, you won’t want to draw down retirement plan or IRA distributions before age 59½, because that would likely cost you a 10% penalty tax on top of being taxed at ordinary income rates. After age 59½, Roth IRA distributions may be completely tax-free, but you still might prefer to keep those assets intact for your heirs. (Roths don’t require mandatory distributions during your lifetime.) Other decisions about drawdowns may depend on several tax-related factors. It may be advantageous for you to receive taxable brokerage account distributions in a year in which you expect to be in a low tax bracket and below the threshold for the 3.8% Medicare surtax. 3. Tactical tax planning. Your approach to tax-efficient investing will typically reflect various aspects of your financial plan as well as applicable tax factors. Frequently, your situation will dictate that you harvest capital losses at year-end to offset capital gains. 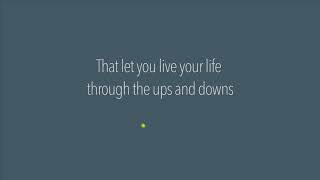 Or you might do the opposite if you have prior losses that will soak up any capital gains you harvest now. Another idea is to use tax-sheltered life insurance as a planning device. The objective is to put a sizable dent in your overall tax liability. 4. Incentive-based tax planning. Finally, your plans should incorporate ways to take advantage of tax-based incentives in the law. One prime example is to convert traditional IRA funds into a Roth IRA—in effect, paying a conversion tax up-front in return for tax-free benefits in the future. 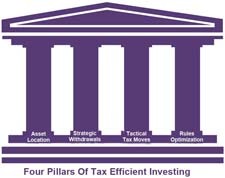 Other techniques are designed to squeeze through tax loopholes that apply to qualified dividends, master limited partnerships (MLPs), leveraged real estate acquisitions, charitable trusts, and oil and gas deals, just to name a few possibilities. Tax-efficient investing is not a one-size-fits-all proposition, so you’ll need to tailor your strategies to your own specifications. Nevertheless, you can lean on these four pillars as a solid foundation. We can help you build a tax-efficient investment plan.